The Parent Chapter of the Nam Knights of America Motorcycle Club is headquartered in Carlstadt, New Jersey. Nam Knights of America Motorcycle Club logos, banners, and all items depicting the Nam Knights name, logo, and colors are Copyright to the Nam Knights of America Motorcycle Club, Inc. All rights reserved. US and International TradeMark(s) Laws Apply. This site is best viewed with 1920 x 1080 Resolution using Google Chrome. This disclaimer governs your use of our web site; by using our web site, you accept this disclaimer in full. If you disagree with any part of this disclaimer, do not use our web site. We reserve the right to modify these terms at any time. You should therefore check periodically for changes. By using this site after we post any changes, you agree to accept those changes, whether or not you have reviewed them. All materials on this site are protected by copyright and intellectual property laws and are the property of Nam Knights of America Motorcycle Club, Inc. Visitors who use this web site and rely on any information do so at their own risk. We are not responsible for the contents or reliability of any other web sites to which we provide a link and do not necessarily endorse the views expressed within them. By sharing any contribution (including any text, photographs, graphics, video or audio) with us you agree to grant us, free of charge, permission to use the material in any way we want (including modifying or deleting it). In order that we can use your contribution, you confirm that your contribution is your own original work, is not defamatory and does not infringe any US laws and that you have the right to give us permission to use it for the purposes specified above. 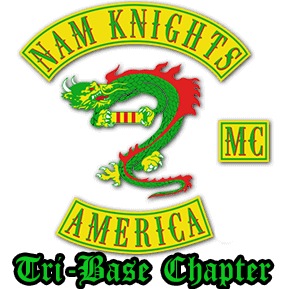 The Nam Knights of America Motorcycle Club, Tri-Base Chapter is a nonprofit, tax-exempt, publicly supported organization under Sections 501(c)(3) and 509(a)(2) of the IRS Code, and is incorporated and registered in the State of New Jersey. All donations are tax deductible to the extent allowed by law. Returns - all orders are considered donations to the Chapter. We will gladly accept the return of products that are defective due to defects in manufacturing and/or workmanship. Fulfillment mistakes that may be made which result in the shipment of incorrect products to you will also be accepted for return. Shipping Time - most orders will ship the one to two business business days. Orders are not processed or shipped on Saturday or Sunday, except by prior arrangement. Personal privacy and security of information are mutual concerns of the Nam Knights of America Motorcycle Club and the Tri-Base Chapter, its members, and visitors to the web site. This statement explains our Internet policies and security measures relating to personal privacy and information security. We may collect and store information about your visit when you visit the www.tribasenamknights.org web site such as browser, IP address, etc. We will not disclose personal information. We welcome and encourage open discussion on the Nam Knights of America Motorcycle Club, Tri-Base Chapter's Social Media sites - including but not limited to Facebook, YouTube, and Instagram pages and look forward to any comments, stories and experiences you want to share. We make reasonable efforts to monitor participation to ensure that you stay on topic, are courteous and avoid making offensive comments. Please be aware that once you post something online, there's the potential for thousands (or hundreds of thousands) of people to read your words, even years from now. As a result, we suggest that you exercise caution when posting on any of our Social Media sites.